Robert F. Carr Memorial Chapel, IIT Veneered Panels Restoration — Bernacki & Associates, Inc. Designed by Mies van der Rohe, the Robert F. Carr Memorial Chapel of St. Savior is a landmark of Chicago’s spiritual – and architectural - communities. The Chapel also holds the notable distinction of being the sole building created by the legendary local architect (and one-time head of IIT’s Department of Architecture) solely for religious services. Van der Rohe’s signature “less is more” style, while lending elegant simplicity to the Chapel, simultaneously caused scars left by time to feel particularly prominent. 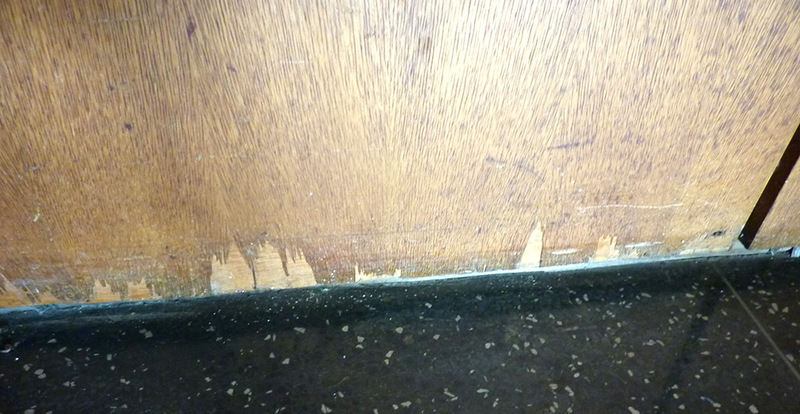 Wood paneled walls and benches had become flawed with significant delaminating and veneer loss. Wood finishing, along with the Chapel’s rails, Travertine altar and iconic stainless steel Cross, had also dirtied with decades of grime.